Lynch Creek Dahlias: Dahlia Pests: Some of 'Em Are Bigger! 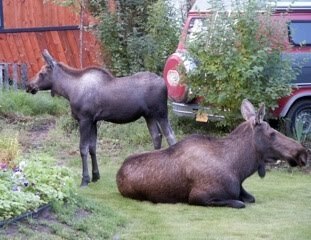 Okay, so maybe we're exaggerating just a little bit to say the moose infestation in Sonja Benson's garden in Fairbanks, Alaska, is a specifically dahlia pest problem. In fact, Sonja says this particular mother-and-calf duo didn't bother her dahlias OR her veggies, and that for the most part, the moose don't come through until the weather cools and she's done picking her dahlias in mid-September. For the most part, you can plant your dahlia tubers and pick your beautiful dahlias without having to share them with your larger wildlife neighbors. It's much more fun to share them with your friends, as Sonja Benson will tell us in the next Lynch Creek Dahlias posting.